Sometimes I pick a topic I am interested in and present it to my garden club. It saves money on a speaker (I don’t accept payment from my club) and it gives me the opportunity to research a topic. 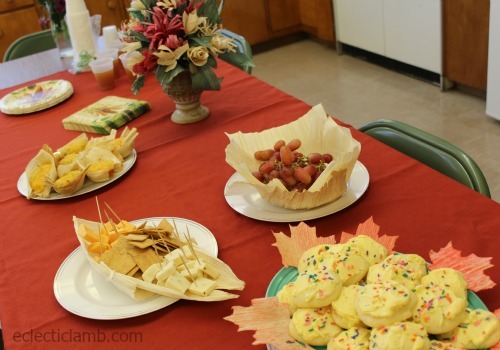 In October I presented a program on the history and uses for corn husk including decorative and culinary uses. 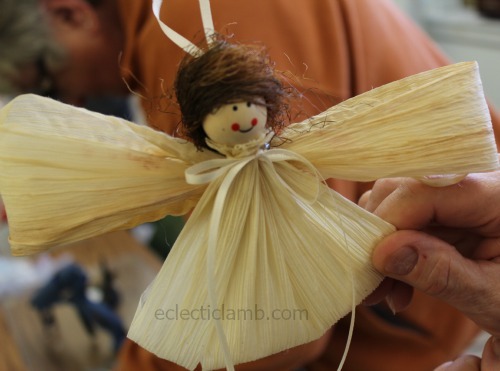 We had a “make and take” of an corn husk angel ornament that members could make and bring home (see the end of this post for the corn husk angel ornament tutorial). 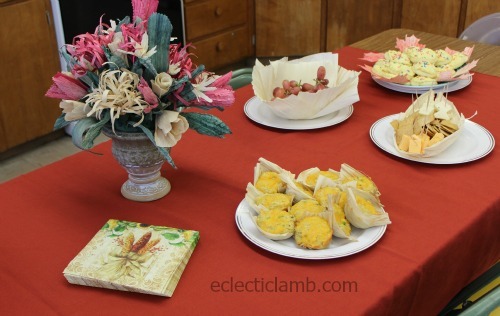 As is the tradition of garden club, I set a pretty hostess table with arrangement (all corn husk flowers of course), and I served the food in corn husk containers. A garden club member helped me to make the corn husk flowers and crafts. Both of us made the flowers and she did an amazing job arranging them. We used this to get started and then made flowers up as we went along and made some leaves. 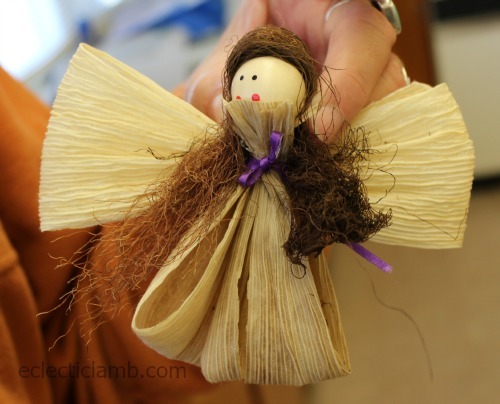 This was my first time making corn husk crafts (I am not counting when I made a corn husk doll in grade school – I had a lot of help with that). 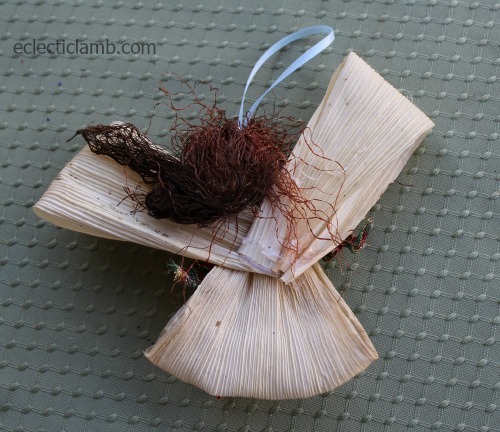 I discovered during the process of making corn husk crafts that it is not my favorite material to craft but I was happy with the results. I signed up to be hostess for the meeting because I wanted to make a corn husk bouquet, corn husk containers, and feature corn in some food. 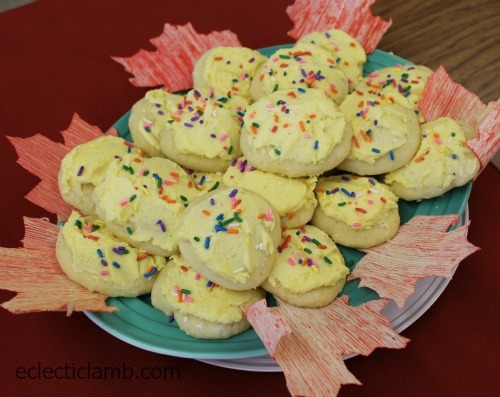 Frosted cookies (made by a garden club member) – I followed these directions for the corn husk leaves and dyed them with food coloring in water. To make my corn husk program more interesting I provided photos and some samples of crafts that I made myself. 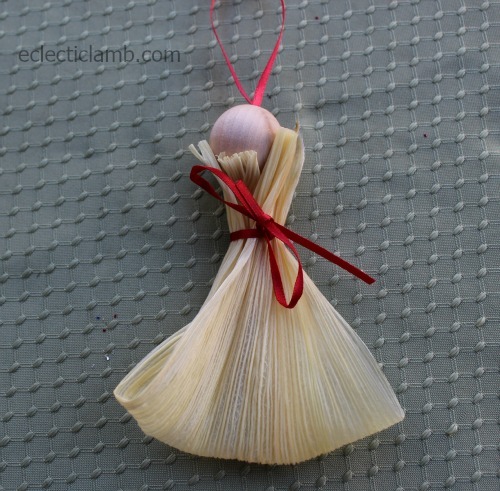 I found it very easy to dye the corn husks with RIT dye. It did turn my wooden spoons the color of the dye so think about that before using your favorite wooden spoon. In some cases I needed to wet the dyed corn husks again to make them more pliable and the dye did not come off in the water or on my hands! 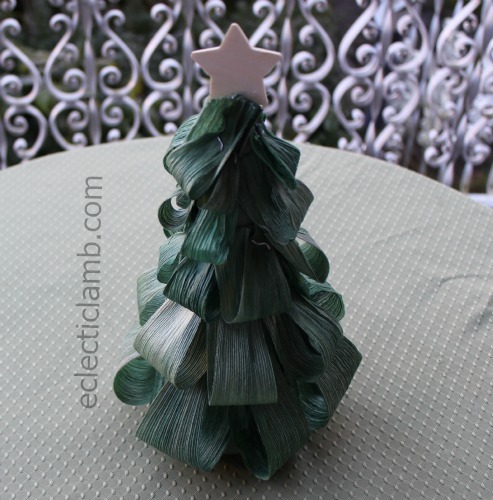 This corn husk Christmas tree was very easy to make. I was inspired by this. I kept it simple and used hot glue to attach a wooden star to the top. 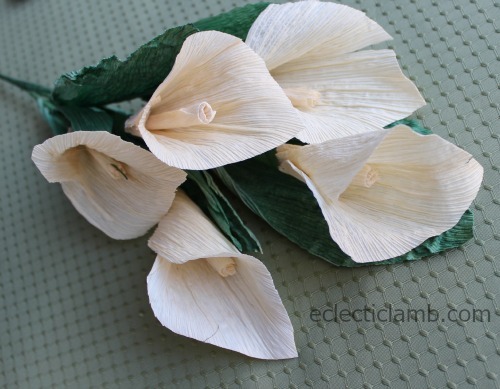 My helper and I made these gorgeous Calla Lilies. We followed these directions. 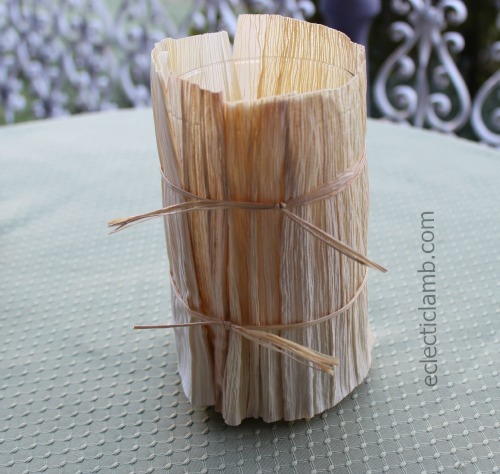 I quickly made this corn husk covered votive. I kept it natural but of course you could decorate it more if you like. 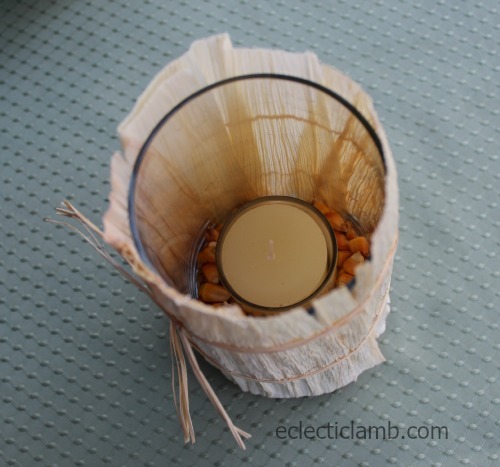 I tried to make it very safe – the candle will not get close to the corn or corn husk, it is in it’s own glass votive. I was inspired by this. 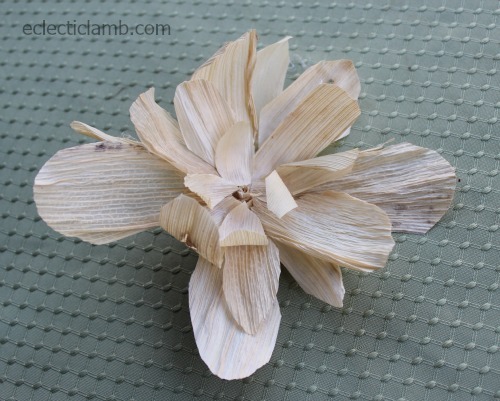 I followed these basic directions to make the corn husk rose. I was worried when it was dry that it did not look like a rose but a little bit if hot glue helped make the shape. 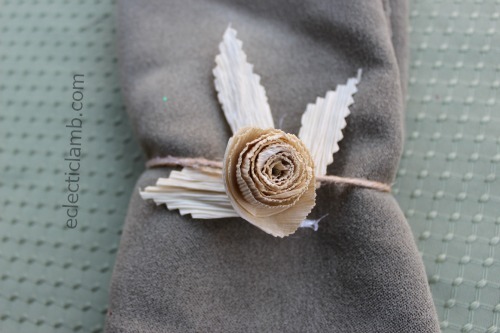 I also used hot glue to attach the rose to the twine to make a napkin ring. 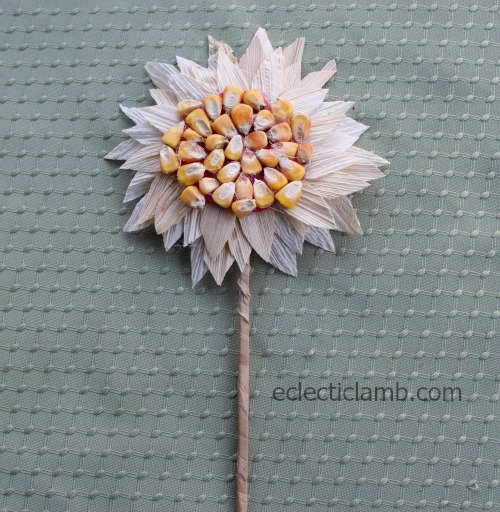 I followed these directions to make a corn husk sunflower. It took a long time to make it. After I was done my husband who normally does not comment on crafts, said that he did not like it. My garden club members said that they liked it but maybe they were just being polite. 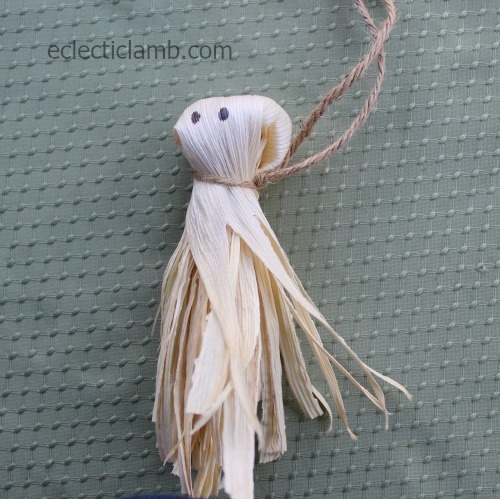 This corn husk ghost was easy to make. 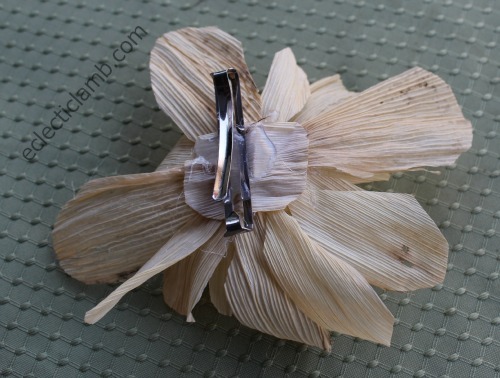 My helper followed this tutorial to make a barrette and broach. 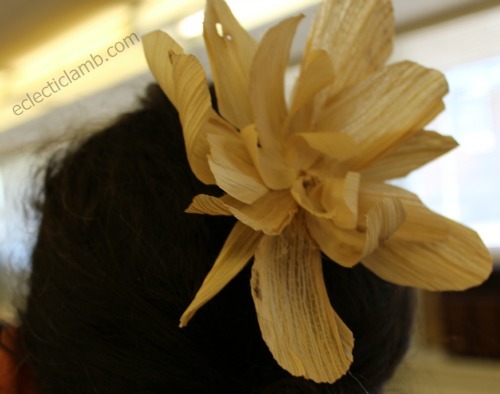 We used hot glue to attach a metal barrette to the corn husk flower. I wore this flower in my hair when I gave the presentation. 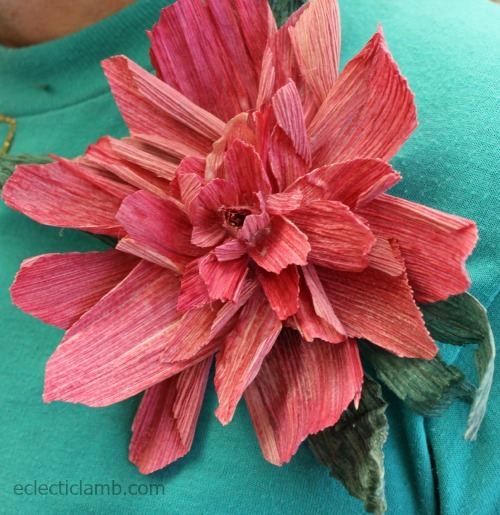 My helper made and wore this corn husk flower broach. She used corn husk that we dyed red with RIT dye. 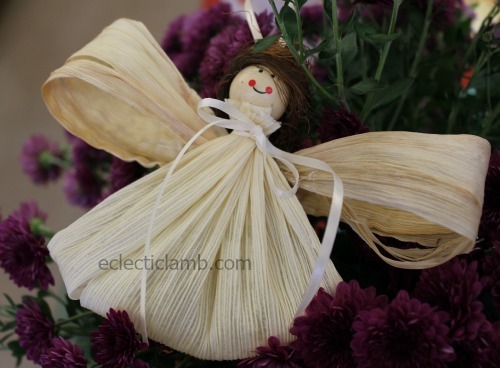 My helper found a photo of a corn husk angel ornament but no directions. We came up with own version and prepared the craft for my garden club members to make and take home with them. 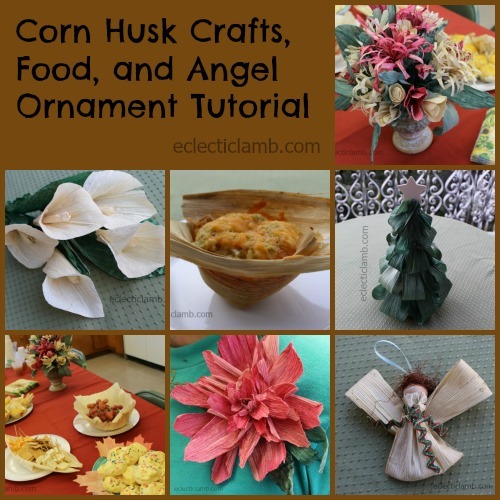 You need the following supplies to make a corn husk angel ornament. 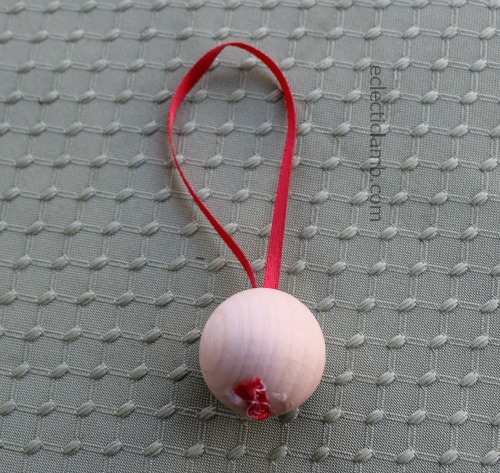 Thread a thin ribbon through the wooden ball, knot and use a little bit of hot glue to keep the ribbon in place. 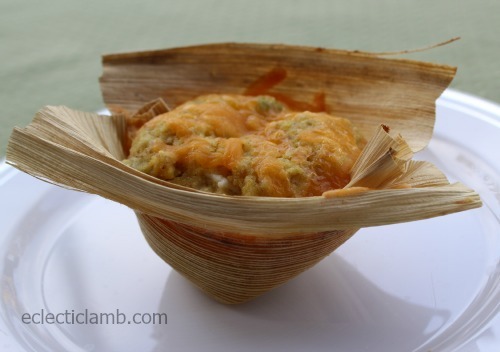 Soak your corn husk in warm water for about 5 minutes. 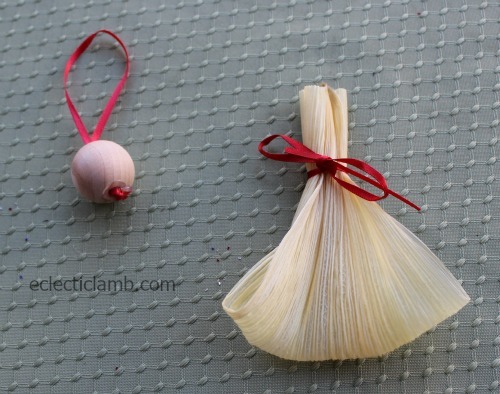 Tear the corn husk to make it a little smaller (experiment to find the size you want). 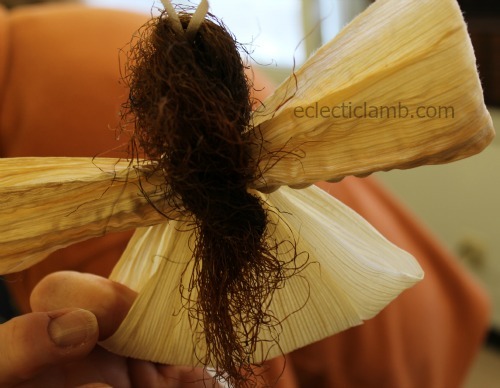 Fold the corn husk in half and tie with ribbon towards the top of the corn husk leaving room for the head as shown in the photo above. 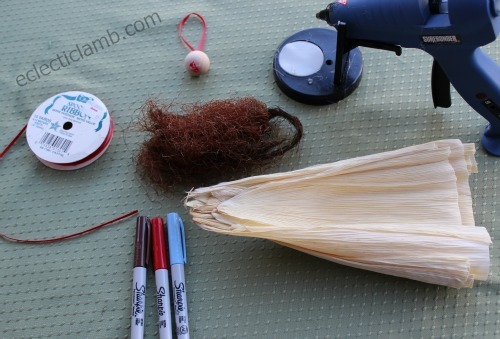 Open up the corn husk to make room for the head and hot glue the head to the body. You may need to trim some of the corn husk afterwards. 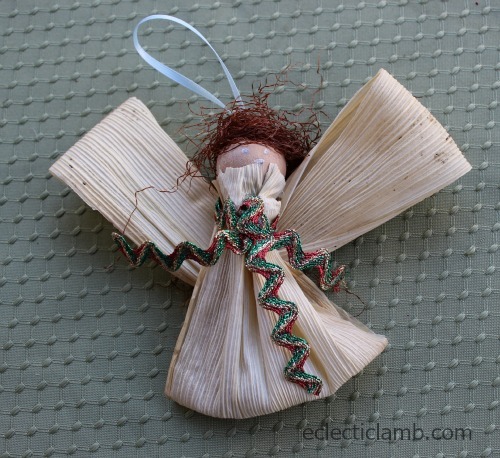 Take two pieces of moistened corn husk, fold and hot glue to the back of the angel’s body to make the wings. 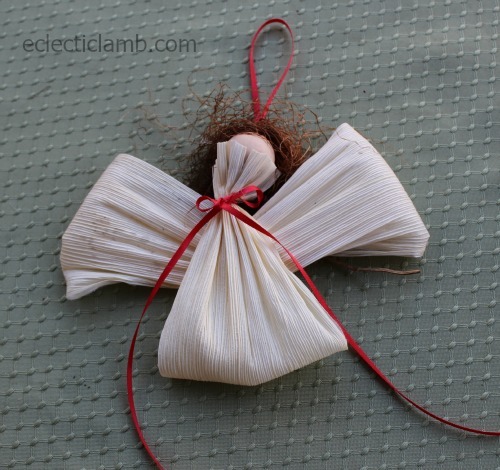 Use dried corn silk, yarn, or the material of your choice and hot glue to the angel’s head. Here are some angels that my garden club members made. 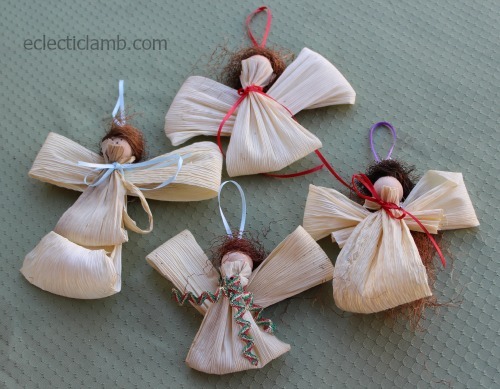 Have fun making your own angels! This entry was posted in Bento / Cute Food, Crafts, Food. Bookmark the permalink. Beautiful job! Very impressive, Kathy! I like the sunflower! I was going to comment that I did even before seeing what your husband said. This is an interesting post, I hope your club members enjoyed learning about the topic. Thank you Rebecca! My club members enjoyed the topic and one even sent me a thank you email! Wow these are very creative ideas! 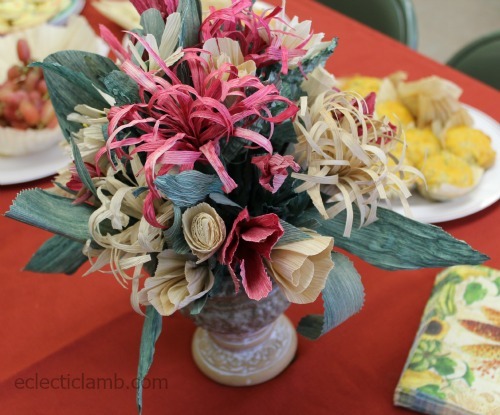 I love these corn husk creations! They’re gorgeous!